If you were to live on the internet, you would think the world is the worst place. 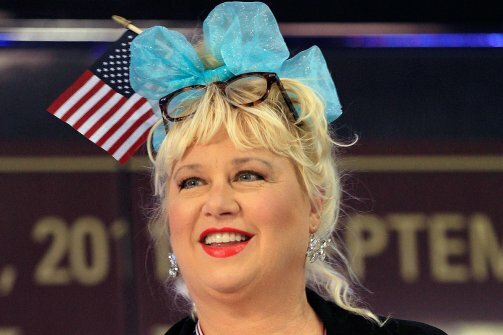 A few weeks ago, SNL star and current conservative court jester Victoria Jackson added to the world wide web’s daily quotient of stupidity by lamenting the fall of the white man in America—now that the brown people and commies are taking over. (I’m not kidding; she actually says that.) Her claim is that we don’t thank white people enough for their contributions to society (has she not watched CBS? )—and to rectify it, we should have a White History Month. Let&apos;s take a moment for a collective facepalm, shall we? When I read about the GOP getting Jonathan Swift-ed, I posted on Facebook—in a fit of anger—that Republicans don’t need a White History Month, feeling like everyone would agree with me. Most people were appalled that anyone would suggest such a thing, but one person spoke out by personally messaging me. This person—we’ll call him Guyn Rand—argued my comments were racially divisive and spoke to the fact that he feels he doesn’t have any outlets for his own identity in today’s society. In his message, he said that he feels increasingly unwelcome in a modern America that&apos;s leaving guys like him behind. This is, of course, despite the fact that, as a Straight White Male, Guyn has the “Lowest Difficulty Setting” in society. When SWMs start elementary school, clubs and organizations will cater to theur needs, make sure they get ahead and has all the opportunities they need to grow up big and strong. What else are the Boy Scouts for? In all of these instances, the framing is predominantly white, heterosexual and male. Great White Men are the founders of our nation, the conquerors of the continent and even on Christmas, they dress up in jolly red suits and bring our presents. We have one nationally celebrated holiday for black remembrance—Martin Luther King Jr. Day (or MLK Day)—and neither Arizona nor DePaul bother to recognize it. This shows just how engrained whites are into our nation’s rituals and why it&apos;s bedlam for many to suggest otherwise we change the status quo and celebrate others. When we think of our sports heroes, we go to Joe Namath, Babe Ruth and Joe Dimaggio, just as our history books are dominated by our Lincolns, Jeffersons and Washingtons, rather than Crispus Attacks and Frederick Douglass, who are honored as footnotes. In the Lincoln movie, screenwriter Tony Kushner considered Douglass so unimportant to our popular history of abolition that he left him out together. Like in The Help, white people solve racism, and black people get to thank them for it—to smile and nod while someone else gets their Oscar. Remember: it took white people to get Django Unchained and Beasts of the Southern Wild made. When we give credence to black filmmakers telling their own stories, it’s either Tyler Perry or filmmakers emphasizing the oppression and suffering of the community—like in 2009’s Precious. (The much better Pariah didn&apos;t get nearly the attention, because it wasn&apos;t a sensationalized potboiler but an honest tale of triumph.) The idea of black people building up their own community (gasp!) is so foreign that efforts of community solidarity are often labeled as Affirmative Action or “reverse racist”—a charge often thrown at Black History Month. The reason that black empowerment is met with such distrust is because people of color are so often marginalized and erased in American society, and empowerment brings visibility to our savage inequalities. Scholars and writers have long pointed out that most white people can barely name five black historical figures—of which Oprah and Denzel don’t count. A recent man-on-the-street video interviewed BYU students on Black History month, and many of them couldn’t even correctly identify Malcolm X or Rosa Parks. For black people, this would be like not knowing who Lincoln is, but no one seems to have a problem with that. Everyone can name ten white historical figures. Interestingly, many interviewees didn’t even know when Black History Month was, and that included some of the black students. We can laugh at them and folks like these for being “stupid” or “ignorant,” which is the easy response, but isolating individuals as the problem only takes us so far. We have to look at this video as a reflection of a society that doesn’t privilege black voices or give weight to black histories, one that deems them worthy of peripheral inclusion but not remembrance. We’ll allow black people to be our best friends and support out own narratives but not to tell their own stories—or listen up when they do. We need to look at this as a sign that our society must be doing more than dedicating one month to black narratives: we need them all year round, in our history books, our novels, our films, our television shows, our comic books and our lives. In America, every day should be Black History Day. Until that time, white people have to start being okay with checking our own privileges—because without recognizing and dismantling hierarchies of oppression, there can be no change. Instead of overrepresenting whites in the media and putting people of color in discursive prison, we need to give others the opportunity to speak, whether they be Latino, Asian, Pacific Islander, Native American, female, transgender or a gay black Jewish gypsy. They are America, too. They are us. Celebrating Marcus Garvey, Josephine Baker, Sojourner Truth, Bayard Rustin, Assata Shakur, Langston Hughes, Angela Davis, Richard Wright and Garrett Morgan isn&apos;t black history. It&apos;s human history. To paraphrase Joseph Campbell, if you only know your own history, you don’t know any. Clearly in America we still have a lot to learn. And for the record, I don’t think Joseph Campbell asked for a White History Month, either.